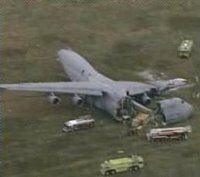 A C-5 cargo plane, the US military's largest aircraft, size of a football field and six stories high, crashed on Monday just short of a runway at Dover Air Force Base in Delaware after problems during takeoff, officials said. All 17 people aboard survived, though several were injured. chicagos neighboring states had a rough weather on sunday from fargo to Tennessee, wicked thunderstorms crashed across eight states, spinning off tornadoes, spitting out hail and killing at least 27 people.